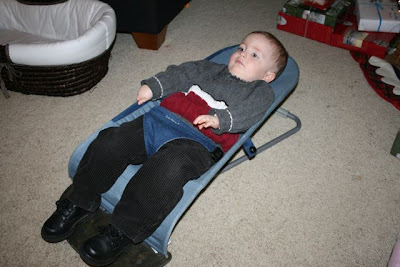 On Christmas Day, as I was preparing Brunch after Mass, I asked Captain to go and get Snuggles old bouncy chair from under the crib so I could use it for the baby. Well apparently Snuggles was not quite ready to pass it down to his new little sister... He was not very happy when I placed her in it, and as soon as I took Rose back out of the chair, he immediately climbed in and tried buckling himself. Well, the timer is about to go off, for the crown cake the girls and I have baking in the oven, so it is time for me to go... Hopefully I will be back later to finish posting our Christmas Pictures. the 12th day of Christmas! Oh my that is so funny! That is what our little Hannah did when we passed her bouncer down to Madelyn. It reminds me of the book, "Peter's Chair." Cute. That is so precious!!! 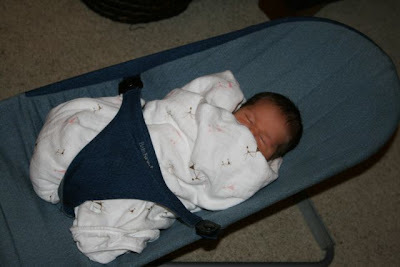 Buttercup did that with the car seat of all things! I have to say THANK YOU! It was so heartening to see the pictures of the battle for the bouncer...I've been frustrated with my 2 1/2 year old doing the same thing...I thought he'd be over it now that his little sister is almost a year old, but he still will crawl into her infant car seat sometimes! Thanks for letting me know my kids aren't the only ones!